Phil Joseph Cavarretta was born July 19, 1916 on the North side of Chicago Illinois. In high school his team won four straight championships & in his senior year his coach took him to a tryout at Wrigley Field. He was so young & small everyone thought he was the bat boy. While facing a veteran Cubs pitcher, Cavarretta hit the ball all over the field & the pitcher yelled to get that kid out of there. The Cubs signed him & he made their club by the end of the same season at age 18, the youngest player in the league. He was a fiery ball player that never stopped hustling even if his team was down by a lot of runs. 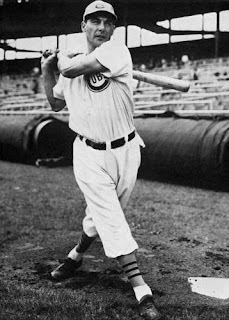 In his rookie season of 1935, he was the Cubs main first baseman, driving in 82 runs, with 28 doubles & 12 triples (fourth in the NL) as the Cubs won the NL Pennant. Post Season: In the 1935 World Series loss to the Detroit Tigers he struggled, batting .125 (3-24). Two of those hits came in Game #4 against General Crowder at Wrigley Field. 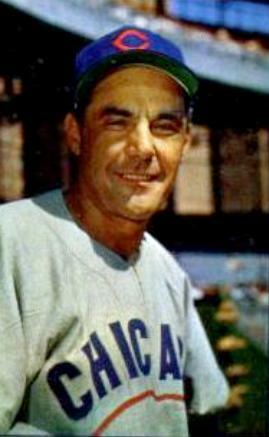 In 1938 the Cubs won another pennant with Cavarretta in a utility role. In the World Series he batted .462 (6-13) hitting safely in all four games of the Cubs losing effort. He would bat over .280 four times up until 1944 when he led the league with 197 hits (tied with Stan Musial) & 142 singles. That year he bat .321 (5th in the NL) with 35 doubles (7th in the league) a career high 15 triples (3rd in the league), 106 runs scored (4th in the NL) & 82 RBIs with a .390 on base % (10th in the NL). In 1945 he would be his best year, winning the N.L. MVP Award batting .355. It is still one of the best averages for a Cubs player in team history. He also led the league with a .455 on base percentage hitting 34 doubles (5th in the league) with 10 triples (5th in the league) 6 HRs, 97 RBIs (8th in the NL) & 94 runs scored (10th in the league). Post Season: That year the Cubs went to their third World Series since Cavarretta's arrival with the club. In Game #1 at Tiger Stadium, Cavarretta hit a solo HR in the Cubs 9-0 win. He hit safely in six of the seven games going 11-26 with one HR & 5 RBIs. In his career, he was amongst the top five batting leaders three times, on base percentage & hits leaders five times. He was also among the tops in triples, doubles & RBIs three times. He played for twenty years with Chicago, the most of any Cub player except Cap Anson. He made four All Star teams and batted .293 lifetime with 1977 hits, 990 runs scored, 347 doubles, 99 triples (163rd all time) 820 walks (230th all time) 95 HRs, 920 RBIs & a .372 on base % (234th all time). He became the Cubs manager in June 1951 succeeding "The Fordham Flash" former NY Giants, Frankie Frisch. In 1952 he finished .500 in fourth place but fell to seventh the next year. Over two and a half seasons he compiled a 169-213 record, but was fired in 1954 he publicly stated that the team wouldn’t finish above fifth place. In a 1992 interview with the Chicago Tribune he said “What I said was, we needed help at first base, at third base and in center field. Mr. Wrigley interpreted that as a defeatist complex.” Later in the fifties he managed at the minor league level & then served as a scout before the New York Mets came calling. 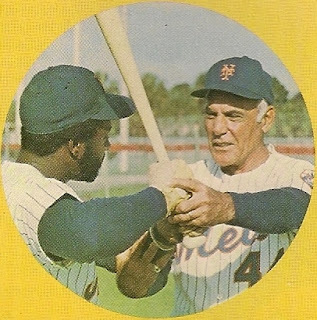 Up until the early seventies batting coaches didn’t really exist in major league baseball and the Mets were no exceptions. In 1973 Mets General Manager Bob Scheffing hired Cavarretta as a special batting instructor to the team. 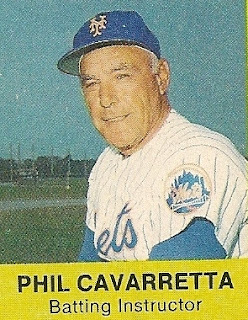 Cavaretta was to work with hitters during Spring Training only, and when the season started he was to instruct in the minor league levels. In his first season as batting instructor he helped John Milner make the adjustment from outfielder to first baseman. Eventually, he was helping the hitters during batting practice at Shea Stadium. He only instructed the hitters at home games & did not travel with the ball club on the road. Cavarretta was a great help to many hitters on both the major & minor league levels. 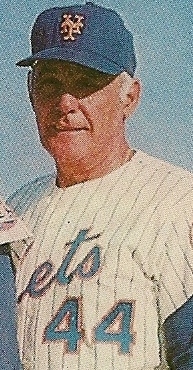 During his first season, the 1973 Mets did get to the World Series. He remained with the team until the late seventies as a coach / instructor before moving on again as a scout. 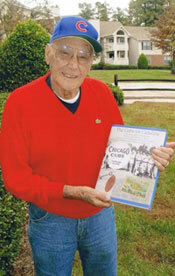 Passing: Cavarretta suffered a stroke in December of 2010 & passed way two weeks later at the age of 94 in Lilburn, Georgia. At the time of his death he was the oldest living former MLB player. He was survived by his wife, four daughters, seven grandchildren & ten great grand children.